Is Oceancash Pacific Showing A Descending Triangle? 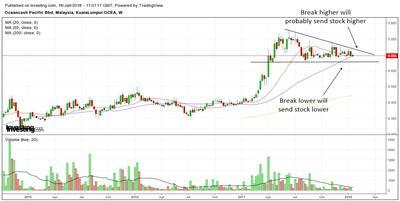 Is the chart show descending triangle? Comments for Is Oceancash Pacific Showing A Descending Triangle? Hi, first of all I would like to say you put a good effort to spot the pattern. Yes, if we look at the weekly chart, we can definitely say that it is a descending triangle. On the other hand, we can also say that this stock is consolidating sideways with support around 0.65. It is waiting to break above a downtrend line. There are no one answers in trading/investing. Just the probabilities. First of all, a descending triangle would work better if the stock is in a downtrend. From what we can see, the stock is in an uptrend. Secondly, the descending triangle pattern happens in a weekly chart with stubborn support at 0.65. Now that we have some facts in hand, we know that if the stock breaks below 0.65, the stock might collapse lower. On the other hand if it breaks the downtrendline, it might go higher. As an investor, you would want to dig deeper into the story of the stock and look at the fundamentals of this company. If you find the fundamentals deteriorating, then the odds of a weekly descending triangle materializing increases. On the other hand, after you dig around and you find that the fundamentals of the company are improving, then the odds of it breaking the downtrendline to shoot higher increases. So, technical analysis should not be used alone. Especially when it is in long term charts. You need to supplement it with some fundamental analysis as well. Join in and write your own page! It's easy to do. How? Simply click here to return to Ask Me A Question Regarding Stocks.